Cyberpunk 2077 is “absolutely an RPG first, shooter second,” with “Borderlands-style” combat that sees “numbers pop out of enemies when you shoot them.” The information comes from a hands-off demo attended by PCGN’s very own Matt Purslow at E3 2018. CD Projekt Red haven’t yet released the footage of Cyberpunk 2077 that was shown at the demo, but the gunplay sounds very similar to FPS RPGs like the Borderlands series, in which the damage you do to enemies appears on screen every time you hit them. That’s something we’ve also seen of Anthem, BioWare’s new sci-fi RPG, in new footage released earlier this week. A list of the best FPS games? In an article about an RPG? How on earth did that happen? The footage also offered a look at some of the Cyberpunk 2077 weapons. Reportedly, there’s “a gun that with homing bullets and one that shoots through walls.” Those weapons, which are named Smart and Tech weapons according to associate designer Kyle Rowley were designed to appeal to RPG fans who may not be used to first-person shooter mechanics. 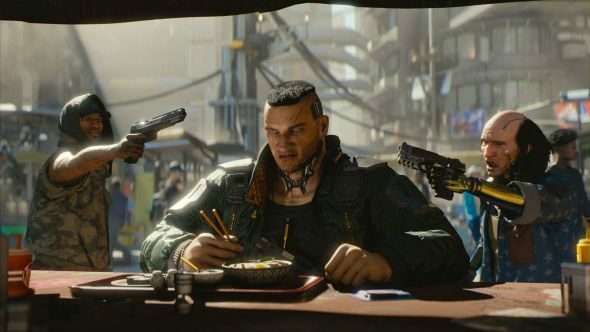 The Cyberpunk 2077 release date hasn’t been confirmed yet, but hopefully we’ll learn more in the coming months – now that the game has officially been revealed, CDPR say they’re ready to talk about it more.